In a recent AAA survey, the majority of bike riders who ride on the road say their number one concern is getting hit by a vehicle. Another main issue was distracted drivers. According to the National Highway Traffic Safety Administration, 840 bicyclists were killed in crashes in 2016—the highest number on record since 1991. Triple-A urges bicyclists to ride on the roadway, rather than a sidewalk, use signal turns, wear a helmet, and follow the same rules of the road as other vehicles. 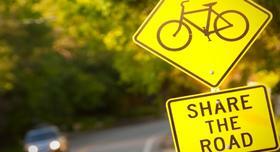 Motorists are also urged to stay alert, avoid distractions when driving, and yield to bike riders while turning.